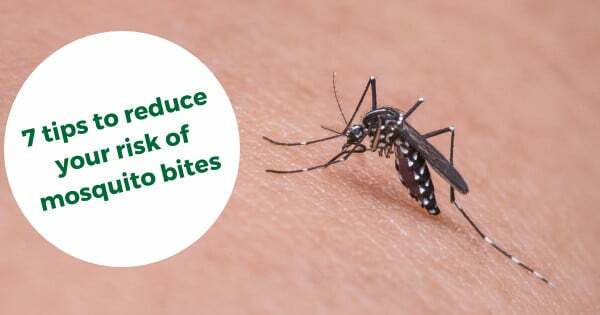 Mosquito bites – Revelling in outdoor activities like jogging, hiking, and barbeques during a long-awaited weekend or school holiday in perfect weather are our desired plans. However, nothing spoils these plans like the whine of a mosquito searching for a fresh blood meal. The itchy mosquito bites and whiny hum of their buzzing wings can ruin not only our daily activities but also affect our quality of sleep. Beyond the nuisance factors, mosquitoes are vectors of some deadly diseases including Dengue fever, Chikungunya, Zika, and Malaria. These mosquito-borne diseases are transmitted by infected mosquitoes to healthy and uninfected people. Unfortunately, there are still no vaccines or drugs to treat or prevent dengue fever, other than avoiding ourselves from getting mosquito bites. Learning how to reduce your risk of mosquito bites will lower the chances that you encounter these unwanted guests in your surroundings. Apply insect repellent to uncovered skin when going outdoors. Repellents containing DEET (common active ingredient in insect repellents) are the most widely available insect repellents in the world. A great deal of testing has been done on DEET insect repellents and they are proven to be safe to use. Vision is one thing mosquitoes use for searching for their blood meal. Black or dark coloured clothes are proven to be more attractive than light coloured clothes for mosquitoes. However, mosquitoes can bite through clothing that is made of thin materials like tights. Hence, long-sleeved thick clothing is advisable as mosquitoes might find it difficult to bite through. To avoid mosquito bites, you might need to plan any outdoor activities when mosquitoes are less active. Although different species have different active hours, mosquitoes are generally more active during dawn and dusk. Mosquitoes are weak fliers, which mean they are not that efficient at flying and are not able to overcome strong wind. Use of electric fan for outdoor activities and gatherings can prevent you and your family from mosquito bites. Mosquitoes usually fly at the lower half of our bodies and near to the ground. Therefore, aim fans to that area. If you notice mosquito bites on your body after hours of sleeping, using a mosquito net would be a good call for you. Any puddles of water around your home can become a potential breeding source for mosquitoes. Always be mindful to empty water from flower pots, plates, pet food, WC pan collar, buckets, barrels and cans at least once or twice a week as mosquitoes’ life cycle can be completed within a week. Always cap the bamboo pole holders when not in use to prevent rain water being splashed into the holders. Remember to keep the gully traps, scupper drains, and roof gutters clean. Thinning dense vegetation will help to improve air circulation. You can avoid getting mosquito bites by making your environment less desirable or appealing to them. The recommended measures discussed above may help to protect you from mosquito bites. However, mosquito bites are inevitable during some uncontrollable situations and in specific environments. To read more, click here. Adoption of permanent measures is strongly advised to address and eliminate the root cause of mosquito breeding. To find out the available permanent measures, you may seek help from our expert team.